Seed: Seeds are simply vessels containing all genetic material and necessary stored energy in order to sprout and begin the life of a tree or other plant. Planting from seed allows the grower more selection in species and is significantly less expensive. Despite a lower cost per unit, planting seeds directly tends to yield a lower survival rate than transplanting a seedling. Planting by seed, does however, help ensure the most common mistake in planting trees, planting too deep, is not made. By placing a seed barely under the soil and allowing it to grow naturally, the chances of stem girdling roots occurring is greatly reduced. Stem girdling roots (pictured on left) are roots that have grown around the trunk of a tree, most of the time underground, preventing the trunk from widening at that point. Stem girdling roots greatly increase the chance of decay and root rot while also slowly choking the tree due to the tight compression on its trunk and vascular system. It is estimated that 57% of all tree deaths on the landscape can be attributed to stem girdling roots, largely a function of mistakes made during planting (2). Seedling: When talking about trees, the term seedling simply means a young tree originated by a germinated seed rather than a cutting or root sprout. Seedlings, as one may guess, cost more than seeds but are much hardier and resistant to harsh conditions because they have already been established and had time to build up respectable defense systems. This resistance is heavily dependent upon species and where the seed was taken from, but in general seedlings survive more often than directly planted seeds. Species with a wide range across different climate zones will actually have significant genetic differences in how they deal with weather. These differences are addressed with the idea of seed provenance- or the geographic location from which seeds originated (4). Bare Root: Bare root planting is a technique in which a seedling is grown, removed from the soil, has the soil cleaned from its roots, and is then transplanted into the ground. This method helps maintain an intact root system as no encircling roots will need to be cut. Exposing the roots directly to new soil they are planted in, rather than being encased in a ball of soil from a container, allows the plant to acclimate to its new conditions more quickly and begin growing faster than otherwise possible. 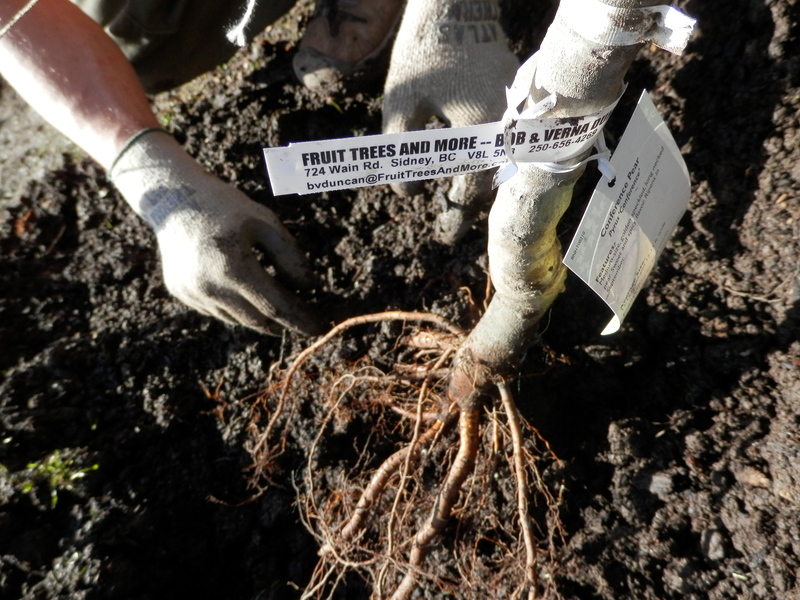 An added benefit to bare root planting is that it makes it easier to be sure the tree is planted at the proper depth. Removing the soil from the roots allows the planter to visually see where the first lateral root branches off from the main root. This lateral root should be placed directly under the soil line in order to give the tree its best chance at long term health and survival. Containerized: Containerized planting is a method in which the grower digs the plant from the ground as bare root stock. This plant is then moved into a container, such as a plastic pot or wooden frame, with a growth encouraging medium. This plant next must take time to further establish its root system in order to hold the new soil together before transplantation. It is important to remember to prune off any encircling roots before finally planting the tree so as to prevent future stem girdling roots. This decrease in intact root system is possible to have an adverse effect on the tree in severe cases. Balled & Burlapped: The Balled and Burlapped planting method involves initially growing a tree in soil. In order to transplant, the tree must be removed from the ground, typically with a tree spade. The tree spade cuts around the above ground stem and removes both the stem and root ball from its original location. This actually separates the tree from most of its former root system, leaving it in the ground where it originally grew, which can lead to slower future growth rates than other planting methods. From this point, the root ball is wrapped in burlap and secured with a wire frame before being transported. Balled and burlapped seedlings are sold at larger sizes than the others, so they are also the most expensive. As with all things, prices vary, but some common trends show balled and burlapped to be about six to eight times as expensive as bare root and nearly twice as expensive as containerized seedlings for the same species. The containerized and balled and burlapped techniques have higher survival rates than bare root planting because of their larger size but sometimes can be the most difficult to plant correctly due to their root systems being hidden by soil. This problem can be easily fixed by simply prodding into the soil with a rod to find the first lateral root and plant accordingly from there. Purchasing: The first thing to look for when purchasing a tree is an ethical, reputable nursery. It is imperative to know that the stock is well managed by knowledgeable tree specialists. This will ensure that the buyer gets what they pay for, rather than buying a stick with a few leaves just to have it die within a few months after planting. The American Standard of Nursery Stock is a great place to find answers to any and all questions about purchasing tree planting stock. It not only has general standards required for all nursery stock, but goes even further to separate trees and shrubs into 13 different categories, each with their own specific recommendations. It also gives specific details on what each nursery measurement means and what it takes to meet its given qualifications. This information does a great job enabling an average customer to understand the differences between a massive conifer and a short shrub and also how these differences may be relevant to a buyer (5). Depending upon the type of planting stock being used, determining when to buy a tree is a big deal. Bare root stock, for example, is nearly always planted in the spring before new growth begins, although if containerized or placed in a gravel bed this time restriction can be lifted. Both containerized and balled and burlapped stock may be planted whenever a hole can be dug in the ground, though research has shown them both to fare best when planted in the early fall. This gives the root systems a chance to more fully develop in their new environment before dealing with the heat and dehydration stress of summer (6). Does this site have anything overhead? How much soil and space is there for trunk flare and a root system? How close is this site to buildings, walkways, parking lots or other potential victims to tree failure? These three questions are very important to consider before deciding where and what kind of tree to plant. An 80 ft tall eastern cottonwood is not the same as a 15 ft tall crabapple, and it should never be treated as such. After considering these factors, we can now dig our hole. For best root growth, research suggests digging a shallow, wide, saucer shaped hole three times as wide as the root ball (2). For all stock types be sure to not cover the top lateral root by more than an inch or two. In the case of bare root trees, it is very important to not allow the root system to dry out or be exposed to hot air or wind and also to firmly pack around the root system before backfilling the hole with soil in order to keep the tree stable and upright. 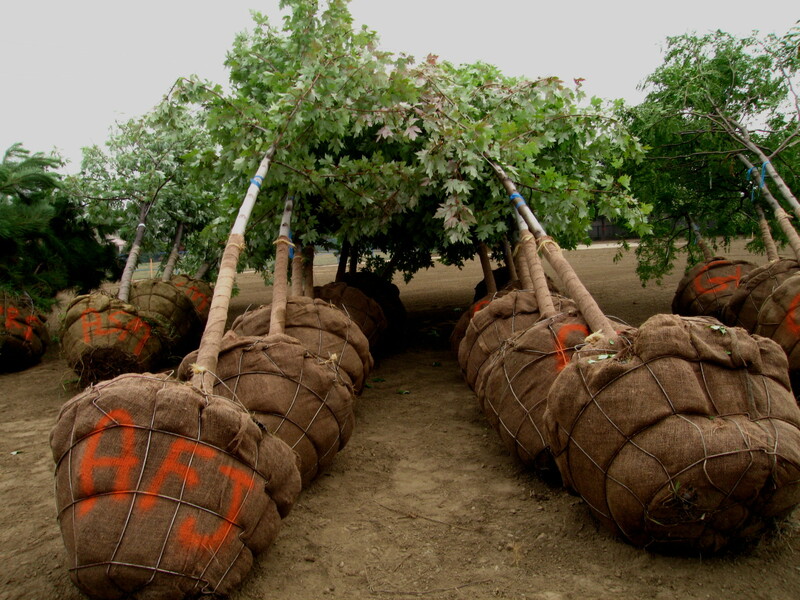 Containerized and balled and burlapped planting stock often both require root pruning of any encircling roots, but a small ring of soil around the bottom of the root ball should be enough to stabilize the trees. After backfilling the hole, the next step is to bring the mulch. Proper mulch application involves 2-4 inches of mulch coverage in a full circle of 3-4' in diameter around the tree while being sure to leave 4 inches of clearance directly away from the trunk. Failure to do this can encourage the growth of stem girdling roots. While all trees can be staked, for containerized and balled and burlapped trees it is often not necessary. The less stable bare root planting stock typically benefits from staking, although the connection to the tree should always allow movement to help encourage trunk taper and future independent tree strength. Staking should also never be done fore more than a year or two and anything attached to the tree should be wide and loose to prevent stem girdling. Thorough weekly watering has been shown to help with tree growth following planting. Although formerly commonly practiced, fertilizing and pruning are rarely beneficial to a tree at the time of planting. Exceptions to this rule are when there is a known soil deficiency or there are visibly dead or damaged branches. Figure 5. This shows a tree with an underground root diagram (9). Dispelling Common Myths: Unfortunately trees and tree planting have been misunderstood for many years. This has led to many misconceptions being spread around like wildfire. One common myth is that a wounded tree will “heal”. This is verifiably false. Over time, a tree will grow around and seal wounds, but the wound itself will never go away. Another popular falsehood about trees is that the roots go nearly as deep into the ground as the tree is tall. This simply does not happen. Almost all of a tree’s roots are contained within the top 18-24 inches of soil. However, a tree’s root system does, in a way, mirror the above ground portion. While not a perfect rule, tree roots are often thought of to be within the drip line of the tree, or the area on the ground that the tree’s canopy hangs above.